Professional pizza peels, pizza pans, baking trays, trolleys and much more. For over 30 years, Gi.Metal has been designing and producing professional articles for pizzerias and trolleys for the catering sector: all ready for delivery for more than 2,000 distributors scattered all over the world. 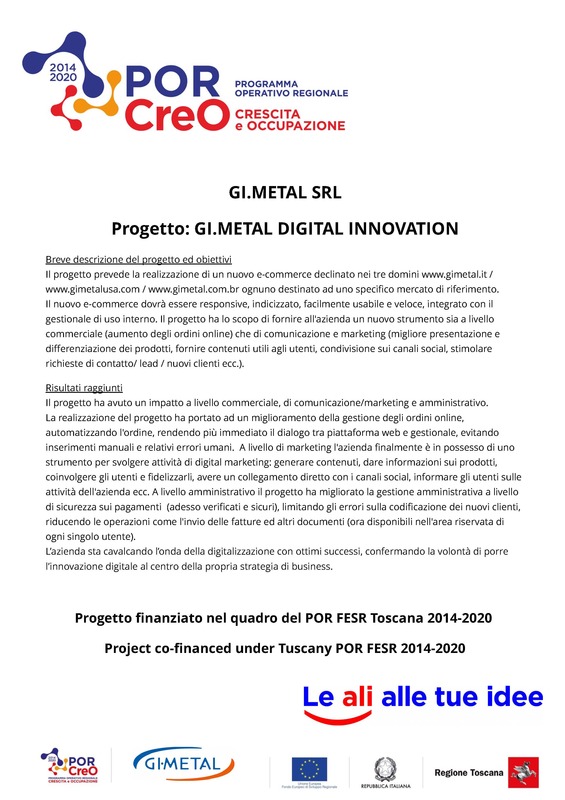 Gi.Metal is an Italian company based in Montale, in the province of Pistoia, and has two foreign branches: one is in the United States, in Chicago, and the other in Brazil, in Curitiba. The company's mission is to work alongside professional and non-professional pizza chefs, to understand their needs, the problems related to their way of working and to develop solutions so that they can work more efficiently, quicker and more productively. Gi.Metal produces more than 600 references for pizzerias and the catering sector. The products which are 100% Made in Italy are synonymous with quality, functionality and beauty. In particular, Gi.Metal offers: pizza scoops, pizza trays, peels, wheels, spatulas, cutters and cruets, as well as trolleys for dining room service and for professional cooking. The production techniques and the materials used are constantly tested and updated to obtain the utmost functionality, comfort, strength and safety, as demonstrated by the ISO 9001:2008 quality certification obtained through TÜV Italy. The Gi.Metal philosophy is to work alongside the professional pizza chefs but also of all those who love pizza and make it a passion to understand the needs, create solutions, realize and distribute them all over the world. There are three values that guide the company's action and behaviour: quality, passion and innovation. The constant search for innovative materials, the attention and the investment of resources for the achievement of increasingly refined and carefully designed works, allow a gradual and continuous improvement of the products, reaching the excellence of which the company is proud of. Every year we participate in more than 20 international fairs around the world, important opportunities to open up trade negotiations, develop new markets, and compare and exchange with existing customers and dialogue with end users. We also take part in numerous events such as national and international festivals, pizza festivals, offline and online contest, where we give our support as technical sponsors and partners to organisations, associations and training schools. Within our plant there is the ‘Palapizza’ space: a facility designed to welcome our customers from all over the world, to train future pizza makers and to show off and test our products. The best technicians alternate in the management of this special pizza parlour, which also has the aim of becoming a training centre for apprentice pizza makers, and a centre for demo and refresher courses for professional pizza makers, all in collaboration with the best training schools which Palapizza has Available.